Lhotse (8,516m) 2014 CLOSED | Edita's Blog - "Intotheblu"
MT EVEREST –MOUNTAIN IS CLOSED FOR 2014 OR NOT? As you may or not have heard, the Climbing season at Mt Everest (south side) is “officially” closed for this season. As you will see in the attached news article, even that is not absolutely certain. Seems one person from the government says it is closed and another says “Some teams may withdraw while some may climb….” Regardless of the Nepalese confusing messages, many are leaving because of safety concerns. Edita called this morning. She was very upset because of the closure, they were still hopeful until this morning. She also seemed quite disturbed after witnessing the politics and mob mentality at the base camp. The Minister of Tourism could not get to the base camp today but a spokesperson made it in a helicopter. After the elevation jump, he had to breath from an oxygen mask during his interventions.. The Altitude Junkies were ready to get going but that will not happen unless some miracle happens. They will stay at the base camp for a few days and then begin their downhill trek on their way back to Katmandu. Apparently, the permits already paid for will be honoured for the next 5 years. So,…whats else is next… I imagine the planning to go back will begin as soon as they get over the shock of not climbing this season. It is very sad for those that this year would be have been their only chance to climb on Mt Everest and Mt Lhotse. I will update you if I hear more but now join me wishing for all to have a safe trip to Katmandu and to their homes from there. Edita called today and as I wrote before, there clearly was some serious differences of opinion between the Sherpas at base camp. As you may have read, Phil and Russell Brice flew to Katmandu to support the Sherpas and speak with government officials. I just saw Phil at the meeting on CNN, so that confirms that! I am attaching a NY Times piece that quotes Phil. It also has a good map of where the avalanche happened as well as a good perspective of Everest in relation to Mt Lhotse. CLIMBING FINISHED FOR SEASON ON EVEREST AFTER DEADLY AVALANCHE? Only time will tell. There is a lot of unknowns right now. Edita wrote tonight before curling up in her cold sleeping bag that “nothing is going on…we are waiting.” They will need their Sherpas. The unknown climbing situation status could go on for days. The Sherpa are meeting with the government this week. Nothing will likely move up until after this meeting in Katmandu. Even then, there would need to be another Puja before climbing begins and that is if the Sherpas willing support the climbers. Edita wrote early this morning from Gorak Shep. “I was really devastated to find out my good friend sherpa Dorje Khatri died in the avalanche. I cried a lot and couldn’t sleep thinking of him and things he said just the day before he died. I wrote a tribute for him but I do not want this posted in the next few days – he is still on the mountain, deep in the snow. 13 Sherpas were recovered yesterday dead. There were many severely injured, do not have exact number. Today the helicopter is back and up lifted 10 climbers – rescuers – who will be looking for the remaining missing 4 Sherpas. Here is a photo I found of Edita and Dorji Kahtri on the summit of Cho Oyu. I have posted this picture Edita sent this morning. The avalanche occurred approximately in the top left area of this photo. Edita’s friend Margaret spoke to the Australian Press today about the terrible ordeal this morning… I am sure Edita and Margaret were close together at the time of the accident. These two really enjoy motivating each other. “We were at the base of the ice fall, we saw the avalanche. It was huge from left to right and we knew the sherpas were there. It was total disaster,” she told ABC News 24. “If we left camp say an hour, two hours earlier we wouldn’t be at the a launch site, we’d be at the bottom of the avalanche. Video of the avalanche. I do not know if this is authentic but looks like the real thing to me. 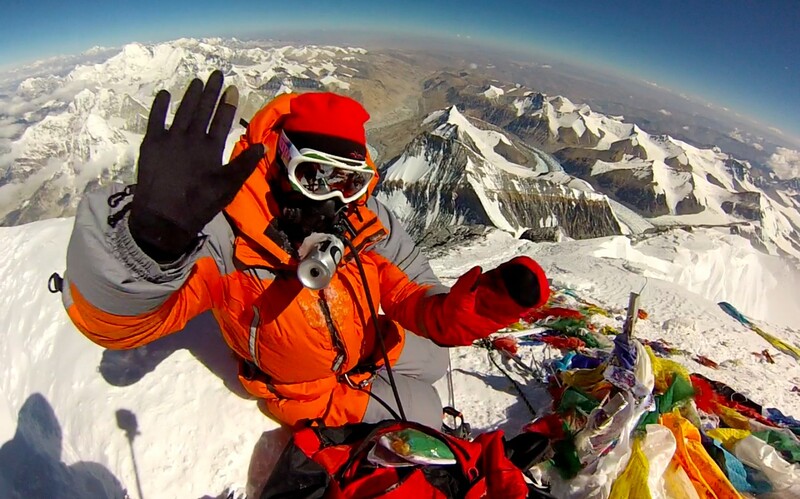 Also Alan Arnete does a great job of being on top of all the particulars of Everest climbs. Edita just sent a text. There are 13 reported dead. Right now, the recovered bodies are being brought down the mountain by helicopter in a sling, one by one. It is not clear what the total number of people that are still missing. There are 5 persons are being treated, one being flown to Katmandu. Altitude Junkies are back at the Base Camp now, safe. Edita wrote ” really, really sad day…Biggest disaster ever…” Edita tells me again, she has lost a close friend. She is very sad. Bless the souls of those that are gone and our deepest sympathy to family and friends of those who died today. All of the Altitude Junkies are ok. This morning a massive serek fell off of the west side of the mountain creating a huge avalanche that covered Khumba Falls. Edita just called on her sat phone. The Junkies were at the foot of the Falls as they watched the avalanche come down above them. Edita sounded a little shaken. There were many Sherpas on the Falls taking loads up to the camps above at the time. This is not good. I will not provide other details on the missing that she spoke of until certain significant others are informed. Phil and other AJs are helping with the rescues at this moment. Helicopters have arrived…. Today Edita and some of the other Altitude Junkies went down to the village of Gorak Shep. She was able to call on her Nepal sim card. There are cafes Gorak Shep and it is a good hike for them too. Again, sorry, no pictures yet. The comms is just not working well so far. There is a lot of snow this year at the Mt Everest/Lohtse base camp and its been generally cloudy, which is unusual. Apparently, this is impacting solar cell towers. Edita sounded great over the crackly connection. Although we sometimes had a hard time hearing each other . . I did hear that Edita, Margaret and the others are having a great time doing warm up hikes/climbs and enjoying the amazing scenes. Lhotse is not a cakewalk either. It is the 4th highest mountain in the world! So they must keep fit and healthy. She told me they plan on doing some practice on Khumbu Falls tomorrow. They will climb and manoeuvre over a few of the flimsy but strong, aluminum ladders. Check it out. It’s been only two days since we left Kathmandu but it feels like a week or more… We took a helicopter ride from Kathmandu to Lukla on Thursday. It is always a thrill to take a heli ride in the Himalayas – beautiful views of the mountains as well as few scary shakes due to turbulence makes the experience unforegetful… Landing in Lukla is also quite an experience, especially if you are landing on a plane. The run away is very short and on the top of the hill… It is known as the most dangerous airport in the world. Helicopter is usually a safer choice. I was here in Lukla few years ago during my four weeks trek and climb of Mera peak. I have great memories from here. It is a busy little town with many shops. There is even a Starbucks coffee shop with free wifi! We stayed in Lukla for couple of hours until all our teammates arrived on different heli rotations. Our group consists of five Lhotse climbers, seven Everest climbers, couple of guest trekkers, our group leader Phil Crampton, and our head sherpa-Sirdar Dorje. We also have 30 other Sherpas supporting the two expeditions (Everest and Lhotse) who are already at the base camp setting up our camp. As soon as everyone arrived in Lukla, we trekked to Phakting where we stayed overnight at the lodge that is owned by our head sherpa Dorje. Friday morning we got up early, had our breakfast and headed out for Namche Bazaar. It took about four hours walking slowly and enjoying beautiful views. I did this trek once before, it was nice to see how little things have changed here. Namche Bazaar is a very vibrant town on top of the hill with many shops and cafés. Many western tourist come through here on the way to Everest base camp (EBC). This is a good place to do your final shopping in case you forgot something in Kathmandu. You can find here even brand shops such as mountain hardware, sherpa gear, etc… As you can imagine, when you have free time, it is very tempting to go shopping even if you don’t need anything… I did not bring my credit card or extra cash, so I am being a ‘good girl’… However, my teammate Margaret broke some unspoken rules and came with some extra ‘resources’… I will write later on some cool new stuff we acquired in Namche as well as before we left in Kathmandu..
Today, Saturday, we are having a day off in Namche Bazar. There is no better place than Namche Bakery to chill out and relax with a cup (or many cups) of cappuccino and fresh baked goods and free wifi! Our Sirdar Dorje co-owns this place. It is very important to take time for acclimatization on the way to the base camp. This is why we are staying in Namche for two nights before we head up higher towards the EBC. Tomorrow we’ll be getting up early and trekking to Tingboche where we will stay at a lodge overnight and next day will continue of trek forwards the EBC. I arrived to Kathmandu yesterday morning but it feels like I’ve been here for a week, so much has been accomplished… It all went so smoothly when I arrived at the airport – I received my visa and bags without problem or delay. The driver spotted me first as soon as I walked out of the arrivals. This is my third expedition with Altitude Junkies (fifth expedition in Nepal) so I feel I am becoming a regular in town and at the Courtyard Hotel. As we drove along the streets of Kathmandu – traffic, rush, dust, noise, colors, smells – it all felt so familiar… I couldn’t contain my joy – I have so many incredible memories from here! I think no mater how many mountains you climb, it never gets easier when you climb at high altitude… I am really looking forward to this new challenge and adventure! Margaret and I having lunch at one of the best somosa place in Kathmandu! I am super thrilled I will be climbing with my incredible teammate and friend Margaret again! Last year we both climbed and summited Mt Everest from the North Side. So, after the briefing with Phil, some of us went to get local sim cards to prepare for our expedition. Apparently, Nepalese sim cards are working at the Everest base camp. This is great, it will save up us lots of money that we would normally pay for SAT phone communications. So, we have new rules on the South side this year. There will be a Nepalese police station at the base camp in case some conflict arises (this is because of the fight that broke out on the South side last year between Sherpas and Simone More/Uli Steck)… We were also asked to collect and bring 8kg of trash after the expeditions – as part of Everest clean up campaign by the Nepalese government. Today I spent all day shopping and getting ready for tomorrow’s departure to Lukla. Although our duffle bags left for Lukla early this morning (to be carried by porters to the Everest base camp), we are allowed 10 kg to carry tomorrow on our helicopter lift to Lukla. Once in Lukla, we will start our trek to EBC. We are planning to reach the base camp on the 11th of April. I will post pictures and updates as our trek to the base camp progresses. Stay tuned! Heading out tomorrow to Nepal to join the Altitude Junkie to climb another 8000er. We will be attempting to climb Mt Lhotse (8516m). Mt. Lhotse is the 4th highest mountain in the world. It is one of the mountains beside Mt. Everest (on the south side). We will be sharing the same base and higher camps with the Everest expedition teams. After camp 3 (7200m) we go our separate ways. Everest climbers go to the left towards the south col and we will go right towards the summit of Lhotse, a knife edge summit ridge. I will keep you posted after I get to Nepal. I was told yesterday (confirmed by Elizabeth Hawley) that no other Lithuanian person has ever reached the peak of Lhotse. Wish me luck and stay tuned for updates.